CANTON, Mass. (July 6, 2015) – This summer, Dunkin’ Donuts is introducing guests to one of its most significant menu expansions of the year, as the brand has officially added Fruit Smoothies and other new frozen beverages as additions to its lineup. 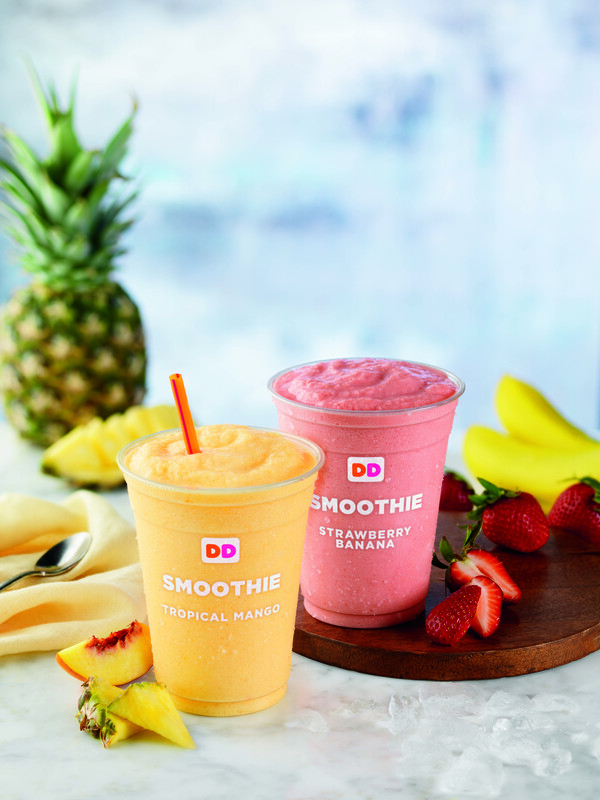 Beginning today, participating Dunkin’ Donuts restaurants will offer two varieties of freshly prepared Fruit Smoothies, Strawberry Banana and Tropical Mango. At 260 calories or less for a 16 oz. serving, both Smoothies are made with real fruit and creamy low-fat yogurt. Dunkin’ Donuts’ newest beverage offerings also include the Frozen Dunkaccino®, a frozen version of Dunkin’ Donuts’ popular hot Dunkaccino®. The new Frozen Dunkaccino is an indulgent beverage with a unique blend of mocha and coffee flavors. Dunkin’ Donuts is also serving a new Coolatta® Lite, a lighter version of Dunkin’ Donuts’ popular frozen Coolatta® beverages. Coolatta Lite varieties offer guests lower calorie versions of the Coolatta, ranging from 33-80% fewer calories for a Frozen Coffee Coolatta, Minute Maid Orange Coolatta, Strawberry Coolatta and Vanilla Bean Coolatta, as well as the Summer LTO Coolatta flavors of Frozen Arnold Palmer Coolatta Lite and Mango Passionfruit Coolatta Lite. Dunkin’ Donuts’ new frozen beverages were introduced in select markets earlier this year following the installations of new blenders at Dunkin’ Donuts restaurants throughout the U.S. The rollout will continue through the year. According to Chris Fuqua, Vice President, Dunkin' Donuts Brand Marketing & Global Consumer Insights & Product Innovation, the innovative new items are an important step in reinforcing the brand’s beverage leadership. “Unique, differentiated products that offer consumers greater variety has been key to our steady, strategic growth and success. Our new Smoothies and other frozen beverages provide new choices our on-the-go guests can enjoy anywhere, at any time of day,” he said. Dunkin’ Donuts’ newest beverage innovation follows the 2014 introduction of its new Rainforest Alliance Certified™ Dark Roast Coffee, one of the boldest additions ever to the brand’s coffee lineup. Made with 30% Rainforest Alliance Certified™ beans, Dunkin’ Donuts’ Dark Roast Coffee uses a unique roasting process to create a bold flavor and smooth finish without the bitterness typically associated with most dark roast coffees. For a sweet twist this summer, Dunkin’ Donuts launched iced coffee featuring the flavors of OREO® or Chips Ahoy!® cookies, as well as OREO® and Chips Ahoy!® Coolatta® Frozen Beverages with real cookie mix-ins in every sip.